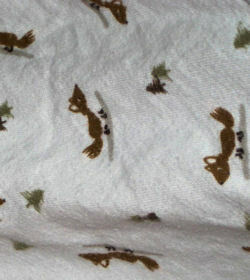 I am desperately trying to find a replica of my 9 month old son’s favorite blanket, “Foxy”. The blanket is large, it measures ~40×40, is light blue and has little brown foxes and green pine trees on it. It is 100% cotton and is only ONE thin layer. You can see the print through the back side of it. It was a FALL ‘07 item, from the Newborn Necessities collection. My mom bought it when I was pregnant on clearance at Old Navy in December or January of 07/08. She said that it was not in a package and looked like it had been washed and returned. There were no others, but she knew it would be big enough for our (big) little man. When he was born, he was eleven pounds and WAY too big for most receiving blankets. This was the only one we had that was big enough to swaddle him in, so we used it frequently. We have been trying to find another Foxy for months now. I have put up Want it Now posts on eBay (three now, since they keep expiring) and have searched tirelessly for several hours every week, and can still not find one! (I usually scour the internet on Friday nights and at least once during the week. It is a scheduled part of my weekend routine.) I have friends visiting the Old Navy “defect” outlet, but they have yet to find the blanket. Any help you may have would be so greatly appreciated! I worry so much about what will happen if we ever lost Foxy! I’ve asked her to answer your comment. Good suggestion!! At this point, I am willing to try ANYTHING! I think that there is a chance that he may be able to cuddle with a sleeper while I at least wash the real thing. He also does have a special teddy bear that sleeps in his crib, and doesn’t leave the crib (yet!). I think that dressing Hucklebeary up is a great idea! If anyone sees the sleepers, let me know! I just purchased one of the sleepers and we are considering buying the lot with the second one, so that if he will not accept the sleeper as a temporary option, i could piece together sections of the two into a quilt! so, than actually finding some of these lovies! The old saying, “Two heads are better than one,” is multiplied here!!! Yeah for Tami!!!! I’ve been mulling this over for a while…I DO have this blanket brand new. I fell in love with the entire line last year and bought the romper, hat, blanket for my hope chest. I am such a sucker for coordinated lines. I dont exactly want to sell it, but $$$ is tight for me right now, so I have listed it on eBay. Item 390003332631. I totally understand if you dont want to pay what I am asking, I just would rather keep it for any less. Please dont hate on me for the price, this blanket is something special I really liked and if I sell it, I wont be able to find another. Best wishes, whatever you decide! I understand money being tight… we are a family of five living on one income of $10/hour. We were prepared to pay $20 or maybe $25. Even that would be a terrible stretch, and would probably have to go on a credit card. (We have made some pretty huge sacrifices to be able to keep me home with my kids.) Unfortunately, I just do not have that kind of money, and my mom won’t lend it to me for something as “silly” as a blanket. I have still had no luck finding the blanket, but have come across THREE of the girl pattern (pink with little deer on it, super cute also!). The outlet seems to have only the girl collection. I did get the sleeper, Matthew thought it was funny, but would still not take to it the way he does the blankie. So I found a stuffed fox at IKEA (who looks sleepy too!) and did some hemming on the pjs, and dressed up the fox. It is going to be a Christmas present. But I am still very much looking for the blankie! The fox must be adorable. Be sure to let us know how Christmas turns out. I have been to the outlet at least 15 times in the past 3 months, and nobody has seen the blanket or any of the sleepers. I have purchased about 15 or 20 newborn hats, but they don’t produce much fabric, so my idea of a quilt is a long way away from reality. He thought the fox in the pajamas was quite funny… he laughed, grabbed him, squealed, bit him, then pulled it back, looked at it (like “what the heck…”) and threw it. That was that. He hasn’t touched it since. So much for that idea! So any help anybody has would be extremely helpful still! I’m so sorry you are having such a hard time pleasing him. We will of course keep your request active, but this may be one of those things he just has to outgrow. I just thought I would write this in here. I am a mother in St. Louis Missouri. My son has this Old Navy Fox blanket, he is almost 16 months old now. He wont go anywhere without it. Ours too is getting a little rough. I have been looking for another one for months. I got the one I have at my baby shower. I have dozens of other blankets that I just knew he would like better than that one. Boy was I wrong. I feel your pain. If I do find more than 1 I will be sure to get it for you. Hopefully we will both be able to find another one soon. We wouldn’t be able to contact you if someone does find one. Please use our Contact Us form. TAMI! THANK YOU SO MUCH! I have put a bid on it, and I am praying that we will win it!!! I will keep you posted. I bid on the blankie, even DOUBLED what we could actually afford to pay (I planned to put it on a credit card) and was outbid 2.3 seconds before the auction ended. Thanks for telling me about the auction though! I'm sorry, but at least you know you did your best to get it. Hopefully another one will show up soon for a better price. I just sat down to do a search for the SAME fox blanket for my son!!!! I feel your pain in searching for a back-up!! I still do searches occasionally… one time one of the wonderful helpers here found one on eBay and I was outbid at $45.00!!!! It was crazy! I tried cutting up 15 knit hats in the same pattern and piecing them into a quilted blanket, but that was incredibly difficult and didn’t turn out to my little man’s liking. Then I bought pajamas and a stuffed fox and gave him that. He loves it, but it doesn’t take his blanket’s place. In the beginning, since its so large, I cut off a 10 inch strip off of one edge, and cut the strip in half, so he had two 10×20 travel Foxies. Recently the blanket starting getting holes all around the edge and the binding was coming off, so I attached a piece of tan muslin to the back and quilted it to help it last longer. It took him a few days to accept that quilted Foxy, but now he loves it just the same! Foxy only leaves the house when he’s sick or going somewhere ALL day now, for safety.